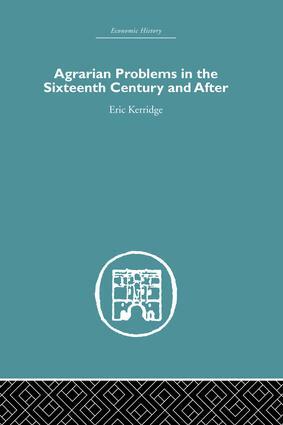 Presenting a full and precise description of all legal ties between landlord and tenant in early modern England, Agrarian Problems in the Sixteenth Century and After re-examines one of the key issues in English agrarian history - the question of the legal security of the copyholder. * depopulation was less extensive than sometimes supposed and that such depopulation as there was often proved economically profitable and not without social benefit. When first published in 1969, this fascinating book represented a unique viewpoint that affected, and in some cases reversed, much accepted opinion. As a landmark work in a highly important area of English agrarian history, it still has considerable impact today.